On 24 August 2016, the Ad Hoc Committee on the Appointment of the Public Protector deliberated on the final five candidates. Adv Busisiwe Mkhwebane emerged as the recommended candidate and her name will be submitted to the National Assembly on or before 31 August 2016. Her nomination was supported by all the parties with the exception of the DA. 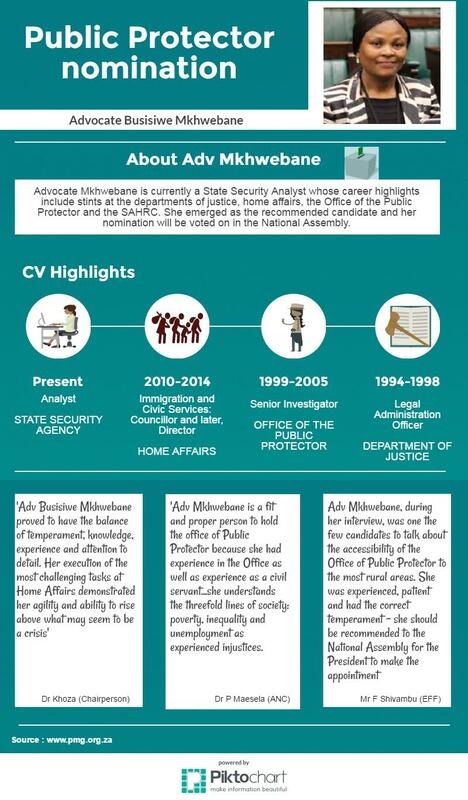 Adv Glynnis Breytenbach, on behalf of the DA said that, while Adv Mkhwebane had a good interview, had legal qualification and some measure of experience, her greatest concern was that she changed jobs from a reasonably high flying position in Home Affairs as a director to a relatively low-level position in the State Security Agency (SSA) as an analyst and this was of deep concern. Mr Julius Malema, on behalf of the EFF, said that after listening to the interview of Adv Mkhwebane, he immediately knew that she was one of the good candidates and he was very happy until he received a tip off that she was actually the preferred candidate of President Zuma. However, he also reminded himself that President Zuma would be leaving at some stage and decisions could not be made as if he would be the permanent president of the country. Furthermore, the institution of Public Protector was well established with rules, established practices and independent investigators – if Adv Mkhwebane tried any "shenanigans", the institution itself would expose her for who she was and this made him comfortable to recommend her. There was equally as strong support for Mkhwebane from the ANC with Members noting the time she spent as an investigator in the Office of the Public Protector, as well as her cool head and the fact that she is a woman. The nomination will have to go to a vote in the House and according to the Constitution, 60% of the National Assembly MPs must vote in favour of the nomination if she is to be appointed by the President.